The shrill whine of sneakers gripping polished hardwood echoed off the walls of the gymnasium. Darnellia Russell’s sleek footwork pushed her across the court as the new SCC women’s basketball coach banged buckets from beyond the three-point arc. The intensity of her gaze coupled with the fluidity of her cat like movements can lead to only one conclu- sion: make no mistake, Coach D Russ got game. Moving up from assistant coach, Rus- sell became the head coach of the wom- en’s basketball team here at SCC just after Christmas break following the resignation of the former coach, James Johnson. Be- fore coming to SCC she was the assistant coach for North Seattle Community Col- lege (NSCC), where she also attended col- lege and received her AA degree. During her two-year tenure as assistant coach she led NSCC to fifth place at the NWAACC tournament. Russell has been playing basketball since the age of eight and hails from the small town of Winfield, LA. “I just always had a ball in my hand,” Russell said. “I didn’t play on my first actual AAU team until I was in seventh grade, but I was always playing.” Having performed at such a high-level in high school, she was recruited as a four-star prospect by almost every major women’s college basketball program in the nation. It hasn’t always been an easy road for Russell. She grew up in the Central District of Seattle, an area known for gang violence and high-crime rates. “My family wasn’t always there for me, but the basketball court was always in the same place,” Russell said. She was a phenom in high school on pace to break several Metro league records for women’s hoops when life forced her to take a step back from the game. At the age of 17 Russell got pregnant, halting her junior year midseason and stalling her teams progress towards the state championship. “A lot of people would’ve given up when something like that happened. Not me,” she continued, “I don’t know the meaning of the words give up, I kept it pushing, I persevered.” After giving birth to her daughter, Russell tried to come back for her senior year but the school and the team barred her from playing the game based on the fact that she had given birth as a minor. Letting nothing stand in her way Russell took to the courtroom and filed motion upon motion for continued eligibility. 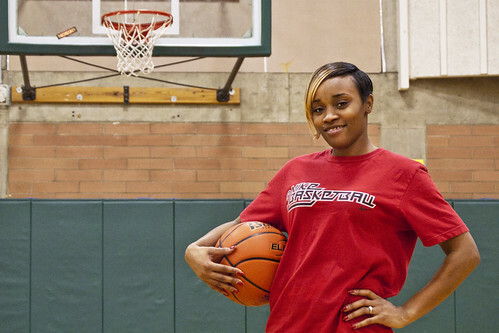 Her efforts were eventually rewarded after a judge in King County granted her the right to play as a fifth year senior at Roosevelt High. Russell made the most of her fifth year senior season. She led an improbable team comprised of three freshman and two se- nior starters all the way to the state cham- pionship game which they won. What she remembered most about the ‘04 Roosevelt squad was, “They were short,” Russell said behind the wisp of a giggle. Russell stands only 5 feet 6 inches tall, which might not be short for a female point guard, but it certainly isn’t tall. Despite her diminutive stature, she has a presence that controls the court and that one can’t help but respect. Russell still plays basketball outside of coaching for the semi-pro squad the Seattle Dynasty. She continues to play at a high level earning MVP honors in both ‘12 and ‘13. During her MVP years she averaged 28 points, 7 assists, 5 steals, and 3 rebounds per game. Her life and basketball career have recently been made into a documentary film which is titled, “The Heart of the Game.” The documentary follows her career throughout high school and her protracted legal battle to regain her final year of eligibility. The courtside docu- mentary details the magical run that the Roosevelt Roughriders made towards the state championship in ‘04 led by their fifth year senior, Russell. The film, which was completed in ‘05, actually received two thumbs up from Roger Ebert. Russell’s take on her teams one and five record so far this season is dismissive, yet encouraging. “My team is improving fundamentally and learning what it takes to be a winning team.” She urged all students to come out and show support for the team. “We’re working on confidence because confidence leads to competence.” Russell indicated that her team is a threat every time they step on the court. She further indicated that her biggest threats to takeover a game are her shooting guard, Breyana Dutro and her point guard, Bianca Benavides. “That’s my one-two punch,” Russell said with a twist to her lips. Coach Russell is a proven leader with a track record of greatness. She drills her team strenuously to instill in them the same work ethic that she possesses. Rus- sell believes emphatically that her team will continue to improve their game so long as she is the one driving them. One couldn’t help but agree with her, after all Coach D Russ got game.